← Bringing home their catch! 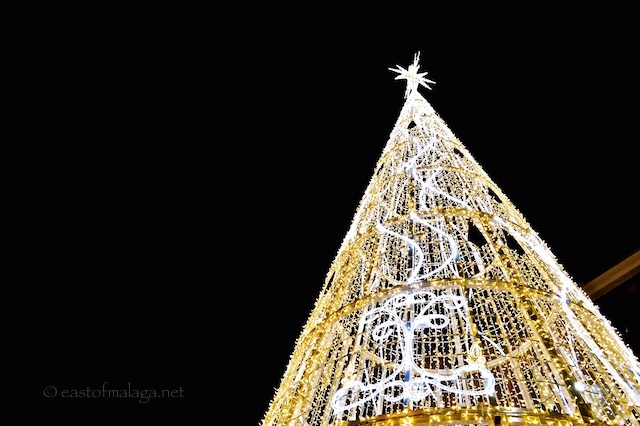 This entry was tagged Andalucía, Chritmas, Europe, fiestas, life, lifestyle, Malaga, photography, Spain, travel. Bookmark the permalink. 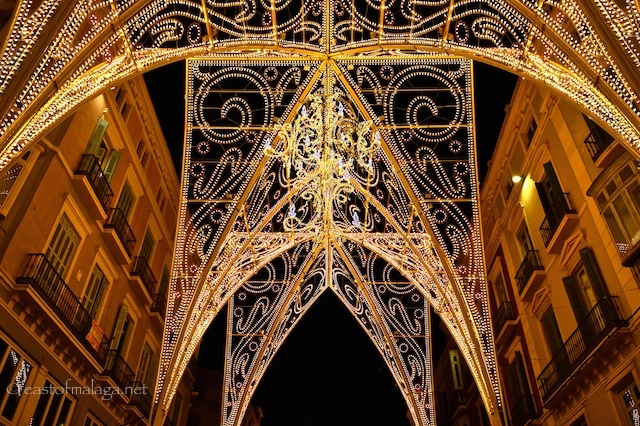 truly impressive – the city has gone all out to decorate its streets and buildings. It’s funny how things work sometimes, Marianne. I was just thinking earlier today that I seem to have lost track of you and there I was, returning a visit to another blog who follows you, and I thought ‘go and see what Marianne’s posting’. So glad I did! This is totally beautiful 🙂 I have a friend who’s thinking Malaga for a holiday base next year- July or September. I think July may be too hot for her? I’ve kept posting all the time on my East of Malaga FB page (link at the bottom of page) – but that has mainly just been photos, with an odd sentence or two. Thank you so much for your very kind comment, Caroline … you have no idea how much it means to me to hear that. 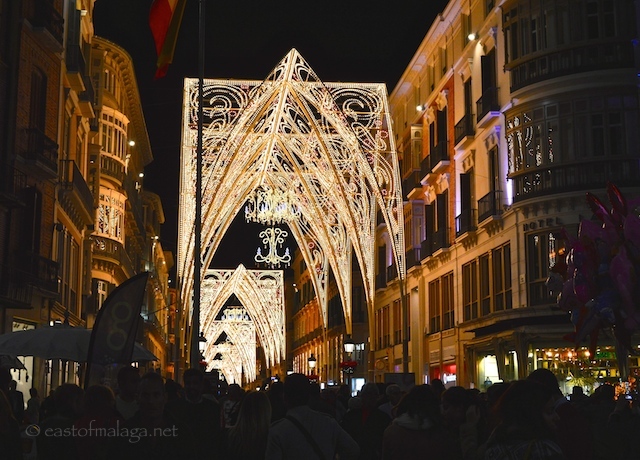 I’m sure you and your friends will have a great time in Malaga – what’s not to enjoy? Great photos! Can’t wait to see them in person. Will be popping down for a day or two just to see the lights. Maybe we can finally meet up? That cathedral thing is gorgeous! Spectacular! I’d love to see something like those lights in Sydney. We did the rounds of the CBD lights and displays late in November before the festive silly season made it unappealing. Early injection of Christmassy-ness. Marianne it’s spectacular, thanks for sharing and I love the sounds of the hot choccy with churros, a bit like doughnuts? No, not really like doughnuts, Gilly – they are cakey, aren’t they? These are a batter dropped into very hot fat and made crispy. This particular cafe makes them so light and crisp, whereas sometimes they can be heavy and fatty. So fabulously festive Marianne! Hope your mother is recovering well. We are enjoying our first Christmas in Spain. The Belen in Torrevieja is amazing. Love your pictures! OOHHH that’s lovely, Darlene – yes, the Belens are usually amazing – such a lot of effort is put in. We’re going Saturday night Marianne and staying over to make the most of our time although the weather forecast isn’t good, still that won’t stop us enjoying ourselves – can’t wait. Have missed your posts as well. 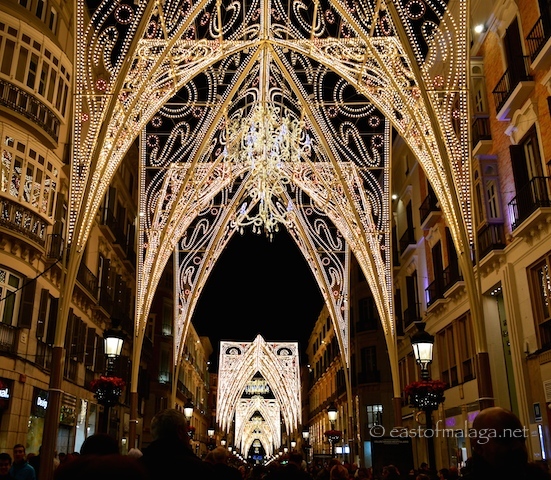 I was there again last night with friends, Keith – and, was on Calle Marques de Larios when the lights actually came on at 6.30pm – and everyone cheered!! There was a band playing, flamenco dancers, balloon artists, mime artists, food for sale …. fantastic atmosphere! Wow, incredibly beautiful! These photos are exquisite! Marianne, thanks for sharing these beautiful light displays. They are truly breathtaking and I was immediately put in the festive spirit just looking at your photos. Spending time with my sister in the Valle de Lecrin in September is on my agenda. Shall we book time for a paella together? Warmest wishes for the festive season and for a new year filled with peace and joy! Thanks Patricia – lovely to hear from you. Every good wish for the festive season. Gorgeous photos, as always – great post! Thanks Sue. As you know, I kinda lost my way for a couple of months, but hopefully, I’m back! 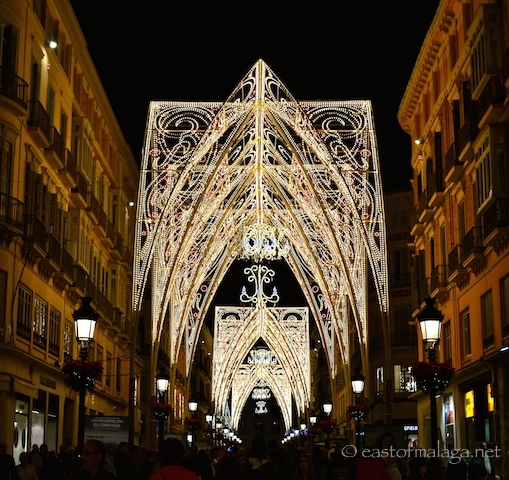 Beautiful pictures, great commentary, thanks for continuing to share Malaga with us. They do Christmas big there! Stunning lights. I’ve missed your posts recently so relieved to receive this latest one – thank you. We are driving down in January but will sadly miss the Christmas lights. Yeah, I’ve not been blogging for the past two months, Rosa. I’ve written some posts in the background, but lost my way a bit. I’ve kept posting on my East of Malaga FB page, because it’s been quick, and mainly photos. Hopefully I’ll be around a bit more now. 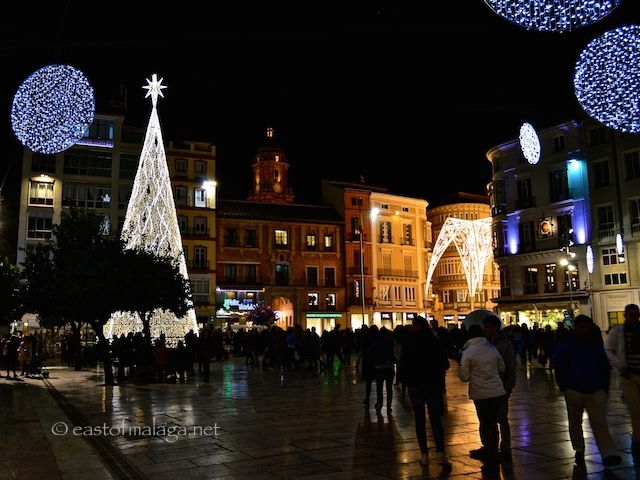 Are you heading for Malaga in January? Yes, with dog and hubby to visit grandchildren west of Marbella. Let’s hope we see some sunshine even if we miss the lights! I must say, my mouth dropped open when I saw them – I was so impressed. They looked good on the camera as I took them, but I have learned from bitter experience that when I load them onto the computer it’s sometimes a different story. However, on this occasion, I was very pleasantly surprised. I had the odd one that was a bit blurred, but overall I was very pleased. Awww you are to kind. I know I’ve been away for a while (it’s a long story), yet everyone is here to welcome me back …. amazing. Thank you. A bit more impressive than our pueblo’s offering this year…. I’d just love to see them! Your city is as grand as Park Avenue in NYC! So impressive! Malaga has blossomed as a city over the ten years I have been here. I hardly like to talk about it sometimes … maybe I should keep it as a secret – but I just can’t!! TOO LATE! Think how many you’ve gotten hooked Marianne! I can’t wait to visit one day! Oh you will! I wouldn’t miss that opportunity dear Marianne! Thank you!!! Thanks Susan … you’ll LOVE it! Lovely 🙂 I’m no fan of Christmas, but I do like the lights. And nice to have you back! Yeah, I know what you mean about Christmas – it’s not the same for everyone. Absolutely stunning Marianne. Must give the place a great atmosphere. What a fabulous sight Marianne, it looks like fairyland? Lucky you. We miss Spain already! You’re right, Pauline – it IS like fairyland!